Originally from New Orleans LA, Jay completed the Masters of Physical Therapy degree at Louisiana State University Medical Center and is a Board- Certified Sports Clinical Specialist. Jay built his international reputation as an expert in biomechanical analysis as Director of the SPEED Clinic at the University of Virginia. Through this innovative venture, Jay was able to blend the fields of clinical practice and engineering to better understand and eliminate the cause of overuse injuries in endurance athletes. His unique approach goes outside the traditional model of therapy and aims to correct imbalances before they affect your performance. Jay literally wrote the book on running gait assessments: he is author of “Anatomy for Runners”, writes columns for numerous magazines, and has published over a dozen professional journal articles and three book chapters. Jay has had an active research career, teaches nationally, and consults for numerous footwear companies, the US Air Force and USA Track and Field. His ongoing research focus on footwear and the causative factors driving overuse injury continues to provide him cutting edge knowledge to educate and provide patients with an unmatched level of innovation and success. Having taught in the Sports Medicine program at UVA, he brings a strong bias towards patient education, and continues to teach nationally to elevate the standard of care for Therapists, Physicians, and Coaches working with endurance athletes. In addition to his clinical distinction, Jay is a certified coach through both the United States Track and Field Association and the United States Cycling Federation, and certified Golf Fitness Instructor through Titleist Performance Institute. He has a competitive history in swimming, triathlon, cycling, and running events on both the local and national level, and has coached athletes from local standouts to national medalists. He is excited to share this passion with the team at Rebound, and explore the Pacific Northwest with his family on knobbies, skis, boards, and soles. Great blog, I would like to follow up with you personally as I am in agreement with your research and train my young athletes to run healthy and efficiently. Jay, I can’t even begin to tell you how much I appreciate your book. It should be required reading for anyone even just curious about running, but more broadly for anyone who works out. You make complex info accessible, which is so crucial for making it usable. Thank you. Love the content here – keep it up! thanks for this Newbodi – always fun to know this stuff if making a difference! Jay, I bought your book when Matt Flaherty mentioned it during his UltraRunner Podcast interview. I bought it immediately. Didn’t really look hard at it until I couldn’t hardly walk Christmas Eve doing some sprints out on the streets. My SI joint was dying! Fast forward 6 days (and some reading) and I have begun doing the exercises in the back. Surprise! Feeling better already and the season (and my running career) may be salvaged after all! Thank you! awesome stuff – our bodies are always a work in progress…..even mine! I’ve worked my way through the book. Like any good academic work, this is packed with data and information. Not a fast read, nor should it be. 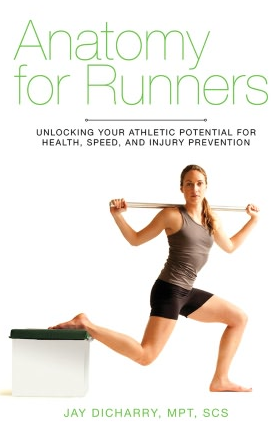 Ironically, my running physical therapist is reading your book as well after attending a continuing Ed class with you. The descriptions with photos for the exercises are generally clear. Are there or will there be short videos of each exercise demonstrating correct form? This would particularly helpful. For example, “core control” shows a nice photo of an attractive abdomen. It doesn’t show hand position to assist the reader in locating the general area. Granted some may just look at the video and pay zero attention to the instruction. That is an issue even with pictures and a mind boggling description. I found your book after searching for “contra kicks” that my physical therapist has me doing because I’m recovering from an injury – I want to not be in the 82% anymore. Thank you for writing this book. Now it is my turn to use it. Just want to let you know that we added your blog to our directory: runopedia.com You have loads of great stuff here that we wanted to share with other runners. thanks Dave – spread the good word! We would be interested in having your blog as an upcoming featured blog of the week on runopedia.com. If you would like to be featured just let me know and I can send out some brief interview questions. Once we receive the answers we will schedule our post and let you know. If you want to communicate with me at dave@runopedia.com that would be great. I am a physical therapist Student from Italy. I realy like your blog. At the Moment I am writing my Bachelor Thesis on Foot Strike Patterns and how they Change the GRF and loading rate. I found some blog entry on your side but there was never a link to studies or other literature. I wanted to ask you if you have some litrature (studies, Reviews…) where they examine foot strike pattern and their relationship to the Impact Forces or where they discuss the relation between foot strike pattern and Injurie incidence. . . Thanks for all the information you have made public. Ive been listening to a number of podcasts that you have featured on and am looking forward to getting my hands on your books shortly. I have already seen drastic improvements implementing a few things you have mentioned. I do have one specific question/out of left field question. I have femoral anteversion I both legs. Have you had any experience or seen any data/studies with how the mechanics are change and are there any specifics that need to be worked on? Hi Daniel- I’ve got an entire chapter on this in Running Rewired – so I strongly suggest checking it out as it goes into a ton of detail on something most people over look. The cliffnotes version: you MUST respect your structure. If you are internally rotated then you’ll remain more internally rotated through EVERYTHING you do (not just running). I’ve seen this be a problem in EXTREME situations, but more often than not its ok. You just need to bring more hip external rotation strength to the table. Again, lots of content in Running Rewired to help with that too. Best! I’ve been a runner for a long time, but I’ve always been pretty random with my strength work as there are conflicting ideas, as you may know. I want to trust in your books as it seems like you’re a good one to listen to for multiple reasons. My question is, what book of yours do you recommend first? If it’s your 2012 published book, is there any new or outdated information you would advise against or is everything still recommended? Any advice is greatly appreciated! Hi Sarah- nothing in either book is outdated. Anatomy for Runners is a bit different audience. If you want to dig deep into the WHY and really understand running, and get the knowledge base to optimize your run and your form get it! 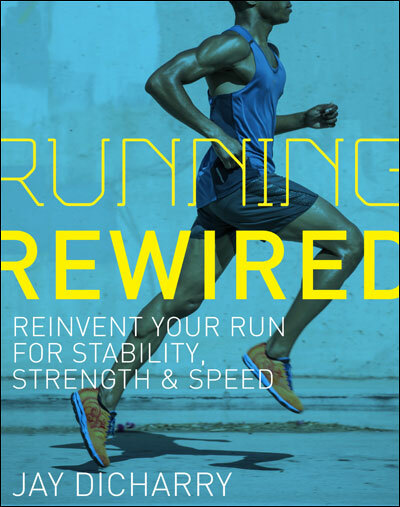 If you are looking for some WHY, but really are looking for a framework to implement a strength and power plan to optimize your run —> with exact plans to follow, then go for Running Rewired ( that book is tailored towards the mainstream running audience and should be stop #1 for most runners. Thanks for reading! I have just read your ‘Running Rewired’ book and was totally captured by it because I have been plagued with niggles recently (previously in the muscles around the knee but more recently hip pain). Your book makes SO much sense and it gives me a lot of hope. Thank you! I have practised the exercises in chapters 5-9 so now I am going to incorporate your master plan into my training and hope this will make me more robust! I’ll try and keep this quick (I would love to meet you but I live in the UK!). I sussed from chapter 8 that my alignment is not straight- my feet natually want to turn outwards, I think this is due to shin torsion because I THINK my knees track straight (thus omitting hip torsion). So I have been rewiring my brain to walk, run, cycle (changed my cleat position) and gym with my feet outwards. I have built it up from a walk to a slow jog. Yesterday evening I jogged on a manual / non-motorised / curved treamill for 20 minutes, really focussing on foot position. Everything felt fine during the run, however, later on I noticed quite significant pain in my knees- I think it is cruciate because the pain is elicited by deliberate internal rotation of my knees. I am trying so hard to work it out but I am struggling. Should I stop trying to run with my feet turned out? Or will my body adapt to this new way of running? Or do you think I have got my alignment diagnosis wrong? I appreciate it is hard for you to give me an answer without a proper assessment, any enlightenment would be VERY much appreciated! Hi Emma! It’s virtually impossible for me to give you any info about your alignment without assessing you myself. I’d find a physio locally that you trust and have them perform the test on you. Then you’ll know the answer for real! -best!